Notes: Esphigmenou (Greek: Μονή Εσφιγμένου) is an Eastern Orthodox monastery in the monastic state of Mount Athos in Greece, dedicated to the Ascension of Christ. It is built next to the sea at the northern part of the Athonite peninsula. Located near the Hilandar monastery, it is the northernmost of all Athonite monasteries. The current monastery dates back to the 10th century, while tradition holds that the site had been used as a monastery since as early as the 5th century. Esphigmenou ranks eighteenth in the hierarchy of the Athonite monasteries and since the early 1970s has been embroiled in legal and ecclesiastical disputes. 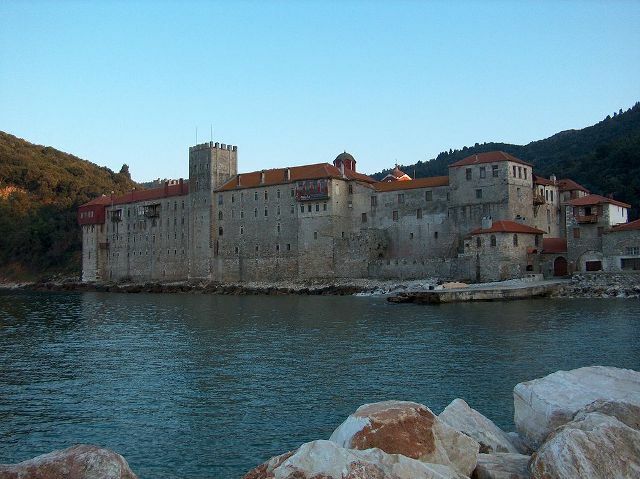 This is the largest monastery on Mount Athos, with around a hundred monks.